Twenty five years ago, Dr. Gardner introduced the term Parental Alienation Syndrome (PAS). Unfortunately, his contributions and his work have been tainted. One anecdote is that his findings were only self-published. Some groups dismiss that Dr. Gardner authored 130 peer-reviewed articles, 19 of his articles related specifically to PAS (Rand, 2011). Critics assert the phenomenon has been “debunked.” The critics mistakenly divert to references by advocacy groups, not peer-reviewed studies. They also commonly point out that the American Psychological Association (APA) lacks an “official statement.” A lack of an official statement does not indicate parental alienation ceases to exist. Even so, the detractors overlook the fact that Dr. Gardner’s work is listed, under “pertinent literature” in the APA’s Guidelines for Child Custody Evaluators. Making matters worse, his critics do not stop at misrepresenting his contributions to the scientific community; they go further, making PAS synonymous with false allegations of abuse (Rand, 2011). The existence of alienation is not equivalent to a denial of child abuse or intimate partner violence (Fidler & Bala, 2010). Slanderous opinions about Dr. Gardner are not worth reading. Still, many groups go out of their way, in the name of so-called women’s advocates, to vilify his work. It is disheartening that facts remain discarded. When facts are ignored, alienated parents and children suffer. There are many views offered, each wearing a unique theoretical lens. Different lens will inevitably provide disparaging observations—some become blinded; others see the light. Blinded perspectives see parental alienation as a normal by-product of divorce. Or, others propose that a child “outgrows” parental alienation. The reality is some parents have been alienated for five, ten, or more years. And, as many alienated parents know, many relationships become permanently severed. Given that parental alienation is not a new phenomenon, parents remain perplexed. They wonder why complaints are dismissed. They waste an inordinate amount of time speculating where they went wrong. Others spend an inordinate amount of money trying to force an ex-spouse to follow ignored court orders. There are many reasons for the delays, such as what to call the problem. Nevertheless, the biggest obstacle, according to the literature, is that many do not accept Gardner’s position. Dr. Gardner (2001) posited that the programming parent is primarily responsible for the creation of the disorder in the child, and if the programming did not take place, the disorder would not have arisen. Dr. Gardner found, through observation, that the causal agent is the alienating parent. Some find this view is “too simplistic.” Consequently, some search for multiple factors wearing a systemic lens; they reason that one parent’s individual mean-spirited antics is not enough to cause an unholy alignment. It appears that a systemic perspective, erroneously blames target parents. A common sense and less complicated view is offered by Dr. Warshak, in his article, Bringing Sense to Parental Alienation: A Look at the Disputes and Evidence (2003). PAS is described as when a child manifests an unreasonable campaign of denigration against, or rejection of one parent, due to the influence of the other parent, in conjunction with the child’s contributions. The campaign is not an occasional episode, but is instead persistent. Still, many dismiss that children are susceptible to suggestibility. Some believe that a child would not turn against a parent, unless the parent had done something to warrant the rejection. People who deny the existence of unjustified alienation believe that children reject a parent only if that parent has abused, neglected, or mistreated them, or demonstrated excessively poor parenting skills (Warshak, 2010). Denying unjustified alienation is punitive. “The position that irrational alienation does not exist essentially means that all rejected parents deserve what they get” (Warshak, 2003). Clearly no fair-minded person blames such hatred on the targets themselves (Warshak). Unfortunately, not everyone is fair-minded. Target parents are blamed, shamed, and depicted as high-conflict bickering parents. Rejected parents endure multiple failed attempts trying to work with an ex-spouse that is not reasonable. Warshak (2003) clarifies that some believe the contributions of the favored parent are over-emphasized while others take the position that multiple contributing factors are under-emphasized. This does not mean rejected parents are off the hook, but they are not primarily responsible. According to Fidler and Bala (2010) rejected parents in an effort to cope may withdrawal or react passively. And, as most alienated parents have not been prepared to deal with the extreme behaviors manifested by alienated children, they may not know how to respond. Clearly, understanding proper responses will aid rejected parents. Though, as Dr. Gardner originally noted, if the programming by the alienating parent did not occur in the first place, the disorder would not have arisen (2001). One can infer that a rejected parent’s role, is not one of primary responsibility; it is not knowing how to respond. Without a doubt, proper responses may offset alienation, but it is beneficial to understand exactly what alienated parents have to deal with. Sadly, some rejected parents do not get the chance to counterbalance alienation because their ex-spouse refuses to adhere to the parenting plan. Studies indicate that rejected parents may be working with an ex-spouse who is malicious and vindictive. They may feel above the law, be deliberate in their actions, or have a mental illness (Fidler & Bala, 2010). Another example of what alienated parents are up against, is depicted by Jaffe, Ashbourne and Mamo, “Although it may seem heavy handed, some parents will only listen to input from the court.” The reality? Alienating parents do not listen to the court. Jaffee et al. provided an accurate description when they highlighted, “A minority of parents who suffer from personality and mental disorders may ignore the court and spend their waking hours finding ways to exhaust the other parent emotionally and financially” (2010). Baker & Darnall (2006) also found support for the alienating parent’s defiance. In regards to parenting time, the most frequently cited response was that alienating parents did not adhere to court orders. In their study, when the rejected parent would go to pick the child up, neither the favored parent, nor the child would be home. Obviously, when parents do not get to see their children, offsetting alienating tactics are futile. As Dr. Gardner noted, “Denying reality is obviously a maladaptive way of dealing with a situation.” The reality? Many are in denial. Studies indicate that alienating parents are not going to change. Alienating parents continue to defy court orders, participate in badmouthing, and intentionally turn an innocent child against the other parent. Consequently, it does not seem fair to blame rejected parents. Dr. Kelly also offered a similar view to Dr. Gardner, “It is the embattled parent, often the one who opposes the divorce in the first place, who initiates and fuels the alignment (Kelly, 2000). Jaffe et al. (2010) suggests addressing the conflict between the parents and that an understanding of the underlying cause is vital. To address the conflict, it seems logical that one parent is out right furious because the other will not follow court orders. To address the underlying cause requires the acknowledgment that one of the parents may not have desired the divorce. Or, another underlying cause is a truth of the human condition: some folks are simply mean. Common sense tells us, if one does not initiate and fuel the alignment, rejected parents would not have to learn proper responses to unwarranted rejection and hatred. For the sake of our children, I pray another 25 years will not pass. Waiting another 25 years believing parental alienation is an abuse excuse, tactic, or cover up will result in unwarranted estrangement. When the favored parent’s behavior contributes significantly to the children’s negative attitudes, leading authorities in the field label this emotional abuse. Our society’s standard of care regarding abused children is to prioritize protecting them from further abuse (Warshak, 2010). Our society’s standard of care also, as the norm, does not blame victims. Without a doubt, not all alienated parents will respond properly at all times. Yet, not all parents have the chance to respond. They try, only to find doors are slammed, letters are returned, or no one is at home. Thankfully, 2010 provided a lot of helpful tools for rejected parents. It is vital we keep in mind that a less than perfect response to unwarranted rejection, does not make one a poor parent. Original post by Bill Eddy, LCSW, Esq. I believe that some children are alienated against one of their parents for no specific appropriate reason. As a social worker, I believe that alienation can be a form of emotional abuse. As a lawyer, I have won changes of custody related to alienation. However, I do not believe that an alienated child should be diagnosed as having a mental disorder. 1. It will feed the Culture of Blame in Family Courts: If it is a psychiatric diagnosis, then family courts will become further bogged down in fights over the diagnosis and who is the “all-bad” parent causing the parental alienation. Such high-conflict court battles are a significant factor in causing alienation, not solving it. A diagnosis will become a new weapon in the Family Court Culture of Blame – and create more alienation, not less, in high-conflict divorces. 2. It will build resistance to behavior change: I believe that child alienation is the result of high-conflict behavior by at least one person (usually with a personality disorder), but often by several people in a child’s environment – much of it inadvertent. I developed the New Ways for Families program of High Conflict Institute to take out the blaming and put in short-term skills training at the beginning of family court cases before anyone has been judged to be an “all-bad” parent. Once a parent has been identified as the all-bad parent, it is next to impossible to get him or her to change anything in their own behavior. Whereas, before such findings have been made, both parents can learn and use skills for dealing with each other and with their children through programs such as New Ways for Families. It’s much easier to get a parent to try flexible thinking, managed emotions and moderate behaviors, if they don’t have to be defensive about their past behavior. 3. It will further isolate children: Thirty years ago I started working with children as a therapist. They often loved the counseling, but hated having a psychiatric diagnosis. Their families and friends often teased them and they felt awkward, alone and different. If you give a child a diagnosis of parental alienation disorder, what will it mean to the child’s sense of identity growing up? Children of high conflict families often blame themselves already for the family’s problems. It seems to me that it will add more weight to the wrong person. It would be more appropriate to diagnose a parent with a personality disorder, because that is more often the driving force behind child alienation anyway. 4. It will distract from looking for other problems, such as abuse: I’m a social worker and I also believe that child abuse and domestic violence are real. Sometimes these problems are present when a child becomes alienated, and often they are not present. But there will be the temptation to see alienation as the one and only problem and identify one parent as the one and only cause. In many cases, this will cause those trying to help the family to miss other problems that also need attention. For more about my point of view as a therapist and attorney, see my book Don’t Alienate the Kids! Raising Resilient Children While Avoiding High Conflict Divorce. What do you think on this controversial subject? Remember to be respectful of each other’s opinions. The essential feature of Parental Alienation (PA) is a delusion; a delusion that a child maintains, often for years on end. Sometimes the child carries the false belief into adulthood. The child claims the delusion is their own. It is taught by a disturbed parent. The parent is one that often did not desire the divorce. He or she may have an undiagnosed mental disorder. Then again, they may not. Perhaps they have traits, or cannot accept their new founded solo status. What they refuse to do, is to set appropriate boundaries. Known by Wallerstein and Kelly (1976 & 1980) as unholy alliances. The boundaries are not healthy. Some ex-spouses desire revenge while others lack intent. Ignoring emotional abuse of children will not make the problem go away. PA shares similar patterns with other DSM disorders. Disorders that currently are listed in the DSM-IV-TR. For starters, PA is comparable to Shared Psychotic Disorder. PA has an “inducer” called an alienating parent, also known as the favored parent. Another commonality, is one person is dominant. The difference between the two disorders is prevalence. Unlike Shared Psychotic Disorder, PA has ample systematic information and is frequently reported is clinical settings, although some might debate the name. Both Shared Psychotic Disorder and PA require intervention because the course is chronic. Oddly enough, many demand more systemic research for PA but it is not required for shared delusions. Differential Diagnosis should also be considered. Both PA and Oppositional Defiant Disorder (ODD) have parents reporting eerie similarities. Children diagnosed with ODD have parents claiming that their children are hot-tempered, argues with adults, defies authority, deliberately annoys others, blames others for mistakes, will not follow rules and are angry and resentful. They are also spiteful and vindictive. The difference between ODD and PA is that ODD manifests with adults that the kid knows well. In PA, the aforementioned behaviors are aimed only at one parent—a once loved parent. The behaviors are reinforced. It is not necessarily that the parent outright says, atta boy! Rewards can be subtle, such as a new cell phone for cussing out mom. Sadly, ODD can get worse. When it gets worse, it gets a new name, known as Conduct Disorder. When PA gets worse, we turn the other way or scoff at people who create helping centers because parents have nowhere to turn. Or, we might look at the target parent and wonder where he or she went wrong. If you are a good parent, you always have good outcomes, right? wrong. Not if you divorced an unstable person. The fact is, the parent did not have to do anything wrong. Conduct Disorder is when a child is physically cruel; they are deceitful and may violate serious societal rules. They may have truancy charges or run away. Severity may be mild, moderate, or severe (just as PA can be moderate, mild or severe.) The kid may not have all the behaviors. Some kids placed in the middle have only a trait or two, such as hitting their parent once and violating rules. We all have heard of resiliency. Regrettably, some kids have parents that make resilience difficult. Reality is that there are parents that will ignore all court orders and continuously use the child as a confidant. The child is forced to hear of adult matters, care for the parent, and eventually feels sorry for the parent. This makes resiliency hard as the kid role reverses and spends time fretting over their “victim parent.” Additionally, the child learns that he or she is above the law. Similar to Conduct Disorder, PA has increased over the last decade. I have not found studies indicating if PA is more prevalent in urban or rural settings (DSM, p. 97). It is more common among high-conflict divorces. And, contrary to some TV shows, it does not always entail bickering back and forth. Yes, PA even occurs with helping professionals; professionals such as psychologists, social workers and attorneys. They too may have a hard time attempting to stop constant denigration and enforcing court orders. Given the grim picture, how do children adjust? There are couples that co-parent amicably and the kids adjust well. We have read about such couples. They have Thanksgiving together. Yes, adjusting may become a disorder. The DSM has Adjustment Disorder. It too shares similar features with PA. Kids may have depressed moods, anxiety, or disturbed conduct. If you are a fortunate parent and your ex-spouse co-parents, the symptoms might be acute. However, for many parents the duration may be chronic. Both PA and Adjustment Disorders will persist if the stressors persists. The stressors in Adjustment Disorder may entail misfortune life events. The stressor in PA, is an alienating parent compounded by groups that turn their head to the emotional abuse of children. NOW is the time to realize that PA is not related to gender nor is it the target parent’s fault. The tender years presumption has long gone. Lastly, Parental Alienation is not a tactic—it is the emotional abuse of children. It is the loss of vitality and life. It is the loss of one parent that does not deserve the rejection. For reminders, if physical or sexual abuse is present, PA is not included in the definition. Recognizing PA as a form of emotional abuse is not a green light to dismiss battering. Frequently overlooked, but worth noting: both PA and DV have elements of power and control. The distinction is that PA places the child in the middle to hurt the other parent. The alienating parent may achieve power and control by threats of leaving the country, threatening expensive court battles, or other coercive tactics. Domestic Violence encompasses power, control and assault. Parental Alienation includes power, control and your children. Now is the time; stand up for the future of your children and your children’s children so that the cycle of alienation will end. Editors’ Note: This is the second part of a two-part article dealing with parental alienation of children and aiding the courts and counsel in recognizing parental alienation in cases involving custody and parenting time. Part I was published in the February issue at page 65. The Family and Children’s Evaluation Team (“Team”),(1) which pioneered the team approach to child custody evaluations in Colorado, evaluated both parents and all of the children in approximately 600 cases fiom 1975 to 1995. The conclusions in this article result from the Team’s evaluations. 1. A narcissistic or paranoid orientation to interactions and relationships with others, usually as the result of a personality disorder. (2) Both narcissistic and paranoid relationships are maintained by identification, rather than mutual appreciation and enjoyment of differences as well as similarities. Perfectionism and intolerance of personal flaws in self or others have deleterious effects on relationships. When others disagree, narcissistic and paranoid people feel abandoned, betrayed, and often rageful. 4. A family history in which there is an absence of awareness of normal ambivalence and conflict about parents, enmeshment, or failure to differentiate and emancipate from parents; or a family culture in which “splitting” or externalizing is a prominent feature. Some alienating parents were raised in families in which there is unresolved or unacknowledged grief as the result of traumatic losses or of severe but unacknowledged emotional deprivation, usually in the form of absence of empathy. More frequently, alienating parents were favorite children or were overly indulged or idealized as children. The alienated parent also has psychological symptoms that are more or less characteristic. The most prominent characteristic is a history of being passive, overly accommodating, or emotionally constricted. The passivity so often seen in alienated parents is difficult to evaluate during the crisis of the divorce. Some passivity is characterological and is usually detrimental to relationships. Some passivity, however, is an adaptation to a marital relationship with a controlling partner. Only a detailed, careful history of interactions and of functioning in other relationships before and after the marriage can lead to a clear understanding of whether the passive alienated parent has a longstanding characterological problem or has made an adaptation to a disturbed marriage. Although alienating parents often feel victimized and controlled, a thorough history may indicate that, in fact, the parent to be alienated has accommodated or capitulated in conflicts many more times than the alienating parent. Although self-assertion may be healthy from the viewpoint of individual psychology, it can lead to an intense and destructive power struggle if the partner to the interaction is uncompromising, unable to tolerate awareness of personal flaws or differences of opinion, or prone to make accusations and engender guilt. In many cases of parent alienation, the passive partner not only tolerates criticism and accusation, but engages in self-questioning. Self-questioning is, of course, healthy, but it may lead to an honest conclusion different from the opinion of a critical partner. It can strengthen a relationship if the different conclusion can be accepted by both parties. In relation to an alienating parent, such disagreements cannot be integrated or resolved. Self-assertion then leads to an intensified power struggle. To avoid intense, intractable, and destructive interpersonal conflict and to preserve the relationship, one partner must then “give in” and accommodate. That partner is usually the parent who is to be alienated. One confusing aspect of the dynamics of parent alienation cases is that the alienated parent sometimes has more obvious symptoms of psychological distress, such as depression or anxiety, than the alienating parent. When psychological health is defined as the absence of internal distress or conflict, this factor makes it appear that the alienating parent is the healthier parent. However, this appearance is misleading. The very presence of symptoms of depression or anxiety implies that internal conflict is present. Depression and anxiety both increase with passivity and when there are limited opportunities for self-assertion or directly expressed anger. Depression and passivity, of course, feed on each other. Depressed people do not have the energy to assert themselves and may not feel justified in doing so anyway; the passivity and emotional constriction lead to more depression. Although the intensity and pervasiveness of depression and anxiety must always be evaluated carefully in order to determine how these symptoms impact relationships in general and parenting in particular, it is possible for parents who are hurting internally to protect their children from their own pain and to be good parents. The accommodating characteristic of the alienated parent sometimes includes a willingness to provide some justification for the alienating parent’s accusations. In general, people seem reluctant to acknowledge irrationality in others, especially those they love and admire. They look for ways to make sense out of the illogical or unrealistic ideas and behavior. When the partner to an interaction is paranoid but not psychotic or bizarre (and this is not only possible but more common than might be thought), the pressure to conform to the paranoid ideation is very strong. Even professionals can begin to doubt themselves, make unusual mistakes, or search hard for barely plausible explanations and rationalizations. The pressure on a spouse, of course, is much greater than that on a professional. For example, it is well known that some men become physically abusive and intimidating in order to prevent a wife from leaving them. In contrast, some parent alienation cases are justified by spousal abuse, but the process is very different. There are reports of longstanding fear and anticipation of abuse, followed by a “confirming” but isolated incident in which actual abuse took place. The parent who lost control then leaves the marriage, intolerant of his own behavior. By that time he has sabotaged himself and justified the paranoid ideation or accusation of his partner. In this example, the usually passive, alienated parent may be correctly designated the “cause” of the immediate intensified marital conflict and the incident of physical abuse is clearly an unacceptable way to resolve an intolerable situation. However, the marital pathology is usually much deeper than one incident and is usually longstanding. The spouse who makes a healthy decision to dissolve the very unhealthy relationship is often accused of desertion, abandonment, or seeking an unnecessary divorce. That spouse has often been unable to make the decision to leave prior to the incident because of the guilt it would engender and the accusation that was inevitable. Parent alienation is not a gender-determined syndrome. Either the mother or the father can alienate; either can be alienated. Some parents have a history of attenuated involvement with their children until just prior to the marital separation. In some cases, this attenuated involvement is longstanding and indicates a lack of interest in parenting. However, in a number of cases that on evaluation were determined to be alienation cases, attenuated involvement was not the result of lack of interest in parenting or concern and caring for the child, but was circumstantial. For example, some fathers of very young children have reported that they accommodated a maternal desire that they provide economic support for mother and child, emotional support for mother, and refrain from interfering with what would now be called an enmeshed mother/child unit. The marital balance was upset when either the child (because of a normal developmental push such as often occurs around age four, for example) or the father (believing that the child is now old enough to relate to someone other than the mother or responding to a change in the cultural definitions of expectations for parents) insisted on increased involvement. An another example, some fathers have attempted to alienate mothers whose involvement with their children was compromised by physical or emotional illness or self-development or vocational requirements by making accusations of neglect even when the attenuated involvement was clearly temporary. Such fathers ignore the fact that good parenting is a joint venture. Each parent should be free to expect the other parent to be available and competent as a “primary parent” when the other is temporarily unavailable. Symptoms of emotional distress are seen in virtually all children of divorce. This distress usually dissipates when a routine that allows frequent and predictable contact with both parents is established. Children then use their energies to cope with and make use of the strengths and weaknesses of both parents and the other important people around them, just as children do in intact families. The importance and impact of the divorce recedes. In parent alienation cases, routine may not be established for years. Intense conflict between parents may last until all emotional and financial resources are consumed. In the meantime, the child experiences unpredictable changes and interruptions in the relationships with both parents as different legal maneuvers take place. The emotional intensity, the pervasive and all-consuming preoccupation with divorce, danger, and protection, as well as the instability, are overwhelming. Many alienated children develop symptoms of anxious attachment or separation anxiety when they are long past the age where separation anxiety is normal. The psychological distress is a result of the malignant emotional environment. The most common symptoms in young children are unusual distress during transitions from one parent to the other, sleep disturbances, regressions in achievement of regulation of bodily functions, and failure to achieve expected levels of impulse control. In elementary school age children, disorganization, inability to attend school work with resultant lowered grades, social isolation, and moodiness are often seen. Psychological distress is not the same as psychological damage. As the children grow older, there are more signs of actual damage to development, especially if the alienating parent is successful. Psychological symptoms thus can sometimes become a perversely valued part of the child’s identity. Because other equally or more important aspects of the child’s experience are less valued and receive less empathic or sympathetic response, the child must use the acceptable symptoms to engage necessary and life-sustaining attention from others. Attempts to engage around interests or concerns that do not parallel the interests of the adults are unsuccessful. Sometimes, especially if the accusation used to justify alienation is child abuse, the alienating parent and allies that parent gathers will assert that the child has been permanently and irreversibly damaged. Such a prediction ensures that the child’s self-concept will be damaged and ignores both important conflicting research as well as information that can be gained directly hem the child. Another area in which the development of a child can be harmed by the process of parent alienation syndrome is that of reality testing. That the child mirrors the distorted perceptions of the parent has been stated. There is a more disturbing aspect of this problem. Children need to develop the function of reality testing, not just about their parents, but also about the world in general. It is essential that they learn not to exclude important information just because it makes them uncomfortable or conflicted. It is also important that they learn to correct misunderstandings and change conclusions with new information. Alienated children tend to become fixed and rigid in their opinions and ideas. They will obviously and actively reject any information that does not confirm their ideas. Too often, their ideas are strongly influenced by feelings, which they often cannot distinguish from facts without help. Having little sense of time (as most people do not during a crisis), they believe that the feelings of today will last forever. If those feelings are exploited or are treated as though they will never change, the child cannot resolve them. Although alienated children are often taken to mental health professionals, they do not generally get the help they need. In order to be helpful, psychotherapy has to be based on accurate diagnosis. Alienating parents have a diagnosis already in mind when they engage a child therapist. The idea that the child’s symptoms can be attributed to any cause other than the one designated by the alienating parent meets with fierce resistance. Therapists may be chosen because of a specialty in evaluating or treating the problem the parent has already “diagnosed.” Such therapists may deliberately limit the evaluation to comply with the contract, because of particular interests or because of lack of expertise in evaluating and treating other conditions. Therapists who have the ability and interest in providing general evaluations that consider a variety of alternative diagnoses and treatment plans can be helpful. However, conclusions and interventions that do not agree with the opinion of the alienating parent are often sabotaged, and the therapists who have them are discharged. If material given by the child in therapy becomes part of the litigation between the parents, the child may feel that it is unsafe to expose thoughts and feelings in any setting. If the child forms a relationship of trust with the therapist and loses or feels betrayed in that relationship, that child’s ability ever to use therapy may be impaired. Finally, alienated children face the problem of parent loss. If the alienating parent will not change, the child will lose one parent or the other. That loss will have consequences, especially if there is no help with sadness and grieving. Younger children will be vulnerable to the unmitigated pathology of whichever parent is chosen for them. Older children will choose, for better or worse. Some children will emancipate prematurely from both parents. All of them will incur the usual results of parental deprivation. Although parent alienation cases are very difficult and painful, they also are a fruitful source of knowledge. These cases test therapists’ knowledge, theories, and professional discipline. They are often discouraging and frustrating. Still, an optimistic view can emerge from the struggles. There is psychological significance to the fact that human beings reproduce sexually, not by cloning. Physically and psychologically, children combine the contributions of two separate, different individuals to form themselves. The child becomes a third individual, unique from either parent. One of the most adaptive aspects of human biology and human social development is that if one adult is not available or helpful, another can take over the parental functions. In an intact family, children quietly and unobtrusively take what they need from those who are available. Their preferences and identifications shift and change over time; different people are favored at different times, preferred according to developmental need and current common interests. In the social systems humans have evolved, parenting is augmented by a whole variety of resources, including schools, therapists, extended family, and the family court. Children thus have a variety of relationships with many people who are different from them as well as with people who are very much the same. These relationships are important resources. They give perspective. If children are allowed free access to these different people, they do not need a perfect parent. It is not individual parental mistakes that harm the development of children. It is the exclusion of these different people that places them in danger of becoming psychological clones, doomed to repeat parental mistakes rather than learning from them. Two parents who can recognize their imperfections and who know that they are mutually dependent can augment each other’s efforts, and protect the children from the undue influence of the human flaws and limitations of each other simply by providing a different perspective and experience. Most children are born with the capacities to think for themselves, to process both negative and positive experience, and thereby restructure things so that each generation can improve over the last. These capacities can be developed. Given opportunities to perceive both healthy and problematic aspects of different people and to respond to those perceptions within the context of an empathic relationship, most children will develop a self that is not only different, but has a good chance of being more functionally effective than either parent has been. Of course, the children will not be perfect, either. They do not need to carry the burden of trying to be. No human being is perfect. The child who is solely or primarily dependent on one parent is in jeopardy. The child who has access to multiple relationships with people who can help in different ways and learns to process a variety of experiences is our hope for the future. 1. The Family and Children’s Evaluation Team was comprised of the author of this article, Leona M. Kopetski, MSSW, and Claire Purcell, Ph.D.
2. Benjamin, Interpersonal Diagnosis and Treatment of Personality Disorders (N.Y.: Guilford Press, 1993) at 140-62 and 313-41; American Psychiatric Assoc., Diagnostic and Statistical Manual III-R (Wash. D.C.) at 348-351; Lyons, Personality Disorders: Diagnosis and Management (2d Ed. 1981) at 65-73 and 163-81. 3. Gabbard “Splitting in Hospital Treatment,” 146 Amer. J. Psych. 444 (1980). 4. Bowlby, Separation (N.Y.: Basic Books, 1973) at 212-13. This newsletter is prepared by the CBA Family Law Section. This month’s article was written by Leona M. Kopetski, MSSW who worked as a clinical social worker specializing in the field of custody evaluation, in addition to maintaining a private practice in psychotherapy. She is now retired and living in Seeley Lake Montana, (406) 677-3278. No one disputes that many marriages end in divorce. A portion of these un-happy endings will result in blame, court battles, and bitterness. According to The Center for Divorce Education 10% of divorces are considered high-conflict. The couples that cannot end their divorce by agreeable terms do a great disservice to their children. Frequently, one parent turns a child against the other parent. As a result, the child may reject a once loved parent. This phenomenon has been described in the literature for over 60 years and has been debated for about the last 15 years. It was coined in the 1980s by Dr. Gardner, as Parental Alienation Syndrome (PAS). Out of a rejection for the medical model, it is frequently referred to Parental Alienation (PA). As a caveat, PA and PAS are frequently used interchangeably by the lay person and in various professional circles. Nevertheless, PA is a growing dilemma. Especially problematic is when the alignment becomes so entrenched that children join forces with one parent to completely reject and denigrate the other, once-loved parent. (Warshak, 2001; Baker & Andre, 2009; Darnall, 1998; Wallerstein & Kelly 1980). This denigration may lead to a loss of extended family and severed relationships. Not only is PA an increasing problem for families; it is contentious among professionals. Some clinicians are staunch supporters of the concept that multiple factors contribute to PA. Their clinical work includes samples of divorced families whose children reject them for valid, but nonetheless poignant reasons such as physical abuse, normal developmental phases, or in cases where a parent is an alcoholic. One view (Johnston, 2001) offered is from a family systems’ perspective indicating that PA has many contributing factors. I agree that many factors may lead to estrangement and interrupt, if not destroy, a parent child relationship. Conversely, I propose that it is possible for one parent to harbor hate and resentment towards another; the detestation can be manifested in such a way that a child may suddenly reject a parent that they previously loved. Irrational alienation is possible. According to Gardner’s formulation, “alienated parents are innocent of any behavior that justifies their children’s total alienation from them. If a parent’s behavior does warrant the children’s alienation, this is not a case of PAS” (Warshak, 2001). I agree with Warshak (2002), “When there is no brainwashing parent there is no PAS.” Clearly, it is ideal that the conflict between the parents that prevents the children from having a meaningful relationship should be addressed (Jaffe, Ashbourne, & Mamo, 2010). Yet, the stark reality is that “a minority of parents who suffer from personality and mental disorders may ignore the court and spend their waking hours finding ways to exhaust the other parent emotionally and financially” (Jaffe, et al., 2010). I consider that some parents’ cannot move on with life and may not recover from a divorce. Clearly, alienating parents may benefit from counseling and divorce education programs. However, it is also possible that some will not benefit. 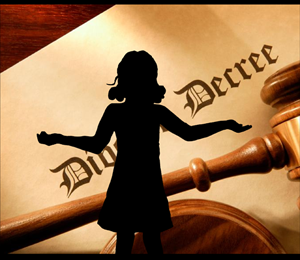 A number of alienating parents defy court orders and do not believe that he or she has any parenting deficits. When custody battles enter the court, psychological testing may be administered. One commonly utilized objective [italics added] test is the Minnesota Multiphasic Personality Inventory-2 (MMPI-2). A study by Gordon, Stoffey & Bottinelli (2010) employed this test to determine differences in primitive defenses such as splitting and projective identification, between cases of PAS and those without PAS. Gordon et al. (2010) defines projective identification as “when one denies personal faults, and projects them on to another and then treats and provokes that person accordingly” ( ¶ 2, p. 225). The concept of splitting is viewed as extreme black and white thinking. As an example, of splitting, alienating parents would describe their ex-spouse as a “bad parent” with no room for human error. In turn, alienating parents indoctrinate innocent children into believing mom or dad is a sorry no-good for nothing of a parent. Gordon et al. (2010) utilized a sample of 158 MMPI-2s from seven forensic psychology practices. Their study consisted of 76 cases of PAS; the control group consisted of 82 cases in which PAS was not present. The authors note, “because of the heated environment surrounding PAS fueled by a number of competing interest groups, only accumulated objective findings can fairly assess PAS” (Gordon et al., 2010). Their research consisted of two traditional validity indexes. The first included: ( L) Lie + (K) Correction for Defensiveness — (F) Unusual Psychopathology as a measure of primitive defenses. Gordon et al. (2010) notes that although L+K–F adds little additional independent information from the individual scales, this index has retest reliability greater than that of the individual scales (¶ 1, p. 216). The scale can measure the denial of aggressive motives. The authors additionally point out that the LFK relationship corresponds to the defense mechanism of splitting. The second utilized was the Goldberg Index: (Lie + Paranoia + Schizophrenia) – (Hysteria + Psychasthenia). Incorporating two indexes allows for measurement of “primitive defenses in different ways” (Gordon et al. 2010, ¶ 2, p. 217). As the purpose of the assignment is to evaluate testing, provide my opinion and a personal reaction; I will not detail findings for all three hypothesis as listed by Gordon (2010) et. al. For starters, I agree with the authors “the MMPI-2 proved to be a valuable research instrument in assessing primitive defenses” (¶ 3, p. 225). This test measured what it intended to measure. The combination of LFK provides insight regarding admission of lying, a tendency to spin answers, and if someone is “faking bad” for special attention (Neukrug & Fawcett, 2010). This test is also useful for the clinical scales. I concur, that multiple assessment measures should be used. Special caution is in order when the issue at hand is a child’s life. High-conflict custody decisions should be made by those with high standards, adherence to ethical standards, extensive training, and out-right common sense. It appears that the MMPI-2 is complementary to clinical interviews, self-reports, and observations. It is not in the child’s best interest to base custody solely on an adolescent’s voiced wish. While Texas law specifies that adolescents may choose; it seems logical that evaluators would realize that a child may be enticed into saying what one parent has taught them. Or, as another example, the adolescent may desire to live where more freedom and material benefit is granted. In cases of Parental Alienation, multiple measures are necessary. In Dr. Richard Warshak’s book, Divorce Poison, How to Protect Your Family from Bad-mouthing and Brainwashing (2010) a disheartening story is provided regarding a twelve- year- old girl that had an inexperienced social worker. The girl wrote her mother a letter and reported that she no longer desired a relationship. The girl’s reasoning was that the mother did not treat her with respect and treated her like a baby (p. 36). This was a case of Parental Alienation in which the father had provided instruction on writing the letter. The social worker in this case recommended that the mother get counseling to learn to deal with teenagers. This social workers failure to include multiple assessments and sound reasoning caused great harm. The outcome was a loss of mother daughter relationship. The MMPI-2 sheds light on the fact that rejected parents, contrary to some findings, are not necessarily part of the problem. In no doubt there may be multiple contributing factors for a child to be estranged from a parent. Yet, I suggest that one person causes Parental Alienation; a bitter ex-spouse. Pathological parents poison their children’s mind and destroy their souls. Gordon, Stoffey and Bottinelli (2008) findings suggest that rejected parents do not favor primitive defenses. As I support the idea that rejected parents in custody litigation are not psychologically different than parents in intact marriages; their research supported my reasoning. They found that alienating parents (both mothers and fathers) had higher T scores compared to the control group (comprised of mothers and fathers) who were in the normal range. I was not surprised by the findings. It is not mind-boggling that one parent via words and actions can turn a child against another parent. This research exposed the poor emotional boundaries between alienating parents and their children. The authors note, “The sharing of primitive defenses helps the child maintain a pathological symbiosis with the idealized alienating parent who is seen as all good while the target parent is seen as all bad” (¶ 5, p. 225). At this point in my graduate studies, I deem that the MMPI-2 augments other assessment measures. In addition to other measures, assessment requires sound reasoning, reflection, and regard. Parental Alienation is when a parent turns a child against the other parent. Wait—it gets worse. The child plays a role as well; the child over time will contribute to hateful antics for a once loved parent. As a warning, Parental Alienation does not only occur in divorced families, but also may take place in intact families. The majority of cases occur after a bitter divorce. The divorce is often one that the alienating parent did not want to endure. Consequently, the parent that was served the papers is at an impasse. They are lonely, angry and want revenge. Feeling hopeless and helpless they attempt to settle the score by aligning himself or herself with their child. Considering that marriages do not last, professionals should educate themselves on the perils of Parental Alienation. The alignment that takes place in parental alienation is unyielding. Yet, it is anything but a normal parent-child bond. Various factors will strengthen the alignment. If the child’s interests, temperament and disposition are closer to the alienating parent, the other parent may end up losing a relationship. Boundaries are blurred and friendships are formed. The parent becomes the child’s new “BFF” (best friend forever). The alienated parent may have no idea why their child is full of anger, spite, and employs language beyond their years. They also feel helpless and wonder what to do about the utter disrespect that they endure. Alienated parents also worry endlessly about the values their child was once taught. Alienated parents’ remain curious as why his or her ex-spouse decides to discard all the good that was imparted to the child when they were an intact couple. Parents additionally question why an ex-spouse would start a campaign of denigration. They are in awe that their child is used as a pawn. To contribute to possible therapeutic options, Gestalt therapy might offer some insight. According to the Gestalt approach, “the past will make regular appearances in the present moment.” The approach is also phenomenological and based on the premise that people must be understood in the context of their ongoing relationship with the environment. For the parent left behind, their view is that their environment screwed them, life is unfair and they must seek revenge to savor their ego and rid internal conflict. They will stop at nothing, even at the expense of an innocent child. Freud might postulate that they are all ID. Gestalt theory also posits that individuals have unfinished business. Unfinished business is when figures emerge from the background but are not completed nor resolved. Clearly, one of these figures may be an ex-spouse and a broken relationship. The feelings go unexpressed and will manifest as resentment, rage, hatred, pain anxiety, grief, guilt, and abandonment. For the deserted parent they will seek to fill this void of unfinished business. They will buddy up with their child and verbally terrorize his or ex-spouse and poison the mind of their child. As the norm, the parent that perpetuates Parental Alienation, does not seek therapy; they do not believe that they have a problem. Consequently, their emotional debris goes unacknowledged. Their present-centered awareness is cluttered and their child is becoming brainwashed. While Gestalt therapy allows one possible lens to view the sickness of parental alienation, it is unlikely that the alienating parent will care how they are thinking, feeling, and doing. Currently, many helping professionals do not acknowledge the danger of Parental Alienation. It is not deemed treatment worthy. However, due to the divorce rate, especially vitriolic divorces, Parental Alienation should capture the attention of every helping professional. The notion that it is junk science should be discarded. Women’s groups should also realize that men too are capable of alienating. Parental Alienation is not biased but it is destructive. The mental abuse of innocent children will continue to occur while innocent parents’ live with worry. Continuing to deny Parental Alienation is harmful to children and families. Just one social networking site alone (facebook) has over 900 members . Individual members are from all around the world; seeking help, searching for children and desiring acknowledgment of PA. Rather than searching for fault-finding and debating treatment options, much can be learned from Person Centered Therapy. Empathy is a key term in Person- Centered Therapy. When it comes to Parental Alienation, Carl Rogers core conditions should be embraced by those in helping positions. I disagree with Rogers notion that we are all innately good and are in pursuit of truth and social responsiveness however; Rogers focus on empathy is desirable for alienated parents. Empathy is not sympathy. Empathy is a deep and subjective understanding of the client with the client. Sure, empathy will not change that one’s child is alienated from him or her. Insight and understanding are not equal to change; nor will insight enforce court orders. The fact is that the alienated parent may never have a restored relationship. Some may lose a child for months, years, or permanently. Parent’s are in emotional pain. “A chief culprit of this pain from the parent’s point of view—apart from the loss of the child—is that of being blamed for the rejection of the child.” (Baker & Andre, 2008). The parents are also in a constant state of worry. The child may continue to live in an unhealthy enmeshed adult-like relationship, in which all the other parent can do is sit back and watch. However, when alienated parents are understood, healing can begin. “If the person does not feel understood and accepted, he or she may lose hope of returning to normal and may not seek help in the future. Genuine support, caring, and nonpossessive warmth can go a long way in building bridges that can motivate people to do something to work through and resolve a crisis” (Corey, 2009). This article is the first in a refereed journal on the program for severely alienated children that has captured world-wide attention. The article passed a rigorous peer review process and provides the first detailed account of Family Bridges: A Workshop for Troubled and Alienated Parent-Child Relationships. We received more than 100 requests throughout the world for advanced copies of this article before it was even published! This groundbreaking article became the centerpiece of an entire issue of a professional journal. The article examines the benefits, drawbacks, controversies, and ethical issues regarding various options available to courts and parents in responding to alienated children, including reunification therapy, custodial transfers, boarding schools, and suspending attempts to repair damaged parent-child relationships. Next, the article describes an innovative educational and experiential program, Family Bridges: A Workshop for Troubled and Alienated Parent-Child Relationships, that draws on social science research to help severely and unreasonably alienated children and adolescents and recovered abducted children adjust to court orders that place them with a parent they claim to hate or fear. The program’s goals, principles, structure, procedures, syllabus, limitations, and outcomes are presented. The article reports on Dr. Warshak’s study of the outcomes of the first 12 families in which he was involved with Family Bridges. The sample was composed of 23 children, 8 of whom were 14 or older. The children had been alienated an average of 28 months. Seven of the rejected parents were mothers, five were fathers. At the workshop’s conclusion, 22 of 23 children, all of whom had failed experiences with counseling prior to enrollment, restored a positive relationship with the rejected parent. At follow-up, 18 of the 22 children maintained their gains; those who relapsed had premature contact with the alienating parent. 34 journal pages with 99 endnotes and citations to 79 social science and legal references. Order now for delivery in February 2010.